May 3, 1738: English preacher George Whitefield (left), the most famous religious figure of the 1700s, arrives in America for his first of seven visits. In his lifetime, Whitefield preached at least 18,000 times to perhaps 10 million hearers. May 8, 1845: The Southern Baptist Convention, now the largest Protestant group in America, organizes in Augusta, Georgia. May 21, 1738: While sick with pleurisy, Charles Wesley (right) — who would co-found Methodism with his brother, John — puts his faith in Christ. “In the name of Jesus of Nazareth, arise and believe, and thou shalt be healed of thy infirmities,” a mysterious voice told him in his sickbed. “I believe, I believe,” he replied. One year later on this date, he wrote O for a Thousand Tongues to Sing to commemorate the event. Use the player below to listen to a brief excerpt from an audio biography of Charles Wesley, recounting how he began to write hymns following his May 21, 1738 experience. The narrator is Whitney Dough, former president of the National Association of United Methodist Evangelists. May 24, 1738: At a prayer meeting in a chapel on Aldersgate Street in London, father of Methodism John Wesley feels his “heart strangely warmed” while listening to a reading of the preface to Martin Luther’s commentary on Romans. This was a pivotal event in Mr. Wesley’s life, transforming him from a largely ineffective Anglican clergyman into one of the most effective and influential leaders in Christian history. Use the audio player below to listen to a radio dramatization of the events recorded in John Wesley’s Journal for May 24, 1738, culminating in his “Aldersgate experience.” This 3-minute scene is from the BBC’s 1997 radio serial, Love Divine, with Clive Francis as John Wesley. May 27, 1564: John Calvin (left), French Protestant Reformer, dies. The United Methodist Council of Bishops issues occasional statements and letters intended to “provide spiritual leadership” to the church. Writing in the March/April issue (PDF) of the We Confess newsletter, Dr. Bill Bouknight, associate director of the United Methodist Confessing Movement, suggests that the Council of Bishops would have provided better spiritual leadership by issuing a letter that set forth the urgent need for the UMC to reclaim its doctrine and its mission. The early Methodists provided many services for people, especially for the poor, ministering in areas of education, prisons, health care, and financial stewardship. But always their first calling was to call people to repent of sin and to trust in the atoning sacrifice of Christ on the cross for their salvation. Brothers and sisters, our primary mandate from Scripture is “to go and make disciples of all nations” (Matthew 28:19). With sorrow and shame, we confess that we have not been faithful to that mandate. With the exception of a few regions of our Church, [such as in] Africa, we have lost our evangelical focus and passion. In contrast to the Early Church in which “the Lord added to their number daily those who were being saved” (Acts 2:47), we seem to have forgotten how to assist God in reaching lost people with the saving gospel of Jesus Christ…. The number of new members received [into the United Methodist Church] by profession of faith is less than half what it was in the 1950s. Over 40 percent of our local churches did not receive even one new member last year by profession of faith…. God asked Ezekiel the prophet, “Son of man, can these bones live?” Ezekiel replied, “O Sovereign LORD, you alone know” (Ezekiel 37:3). And indeed, those dry bones became alive again by the gift of God’s Spirit. The same can happen in our beloved UMC. 1. Following the example of John Wesley, let us observe a weekly fast, repenting for having failed to be an obedient church and especially for having failed to declare the cross-centered gospel to lost persons. We bishops confess that we have failed to fulfill a promise we made when we were consecrated — “to guard the faith, order, liturgy, doctrine, and discipline of the Church” (Book of Discipline, ¶404.1). • All people in their natural condition are lost souls who need salvation. “We believe man is fallen from righteousness and, apart from the grace of our Lord Jesus Christ, is destitute of holiness and inclined to evil” (Article VII, Articles of Religion). “Except a man be born again, he cannot see the Kingdom of God” (Article VII, Confession of Faith). “We believe in the resurrection of the dead; the righteous to life eternal and the wicked to endless condemnation” (Article XIII, Confession of Faith). • The only way to be saved is to repent of sin and trust in Jesus Christ as one’s personal Savior and Lord. “Christ was crucified, dead and buried, to reconcile his Father to us, and to be a sacrifice, not only for original guilt, but also for actual sins of men” (Article II, Articles of Religion). “The offering of Christ, once made, is that perfect redemption, propitiation, and satisfaction for all the sins of the whole world…and there is none other satisfaction for sin but that alone” (Article XIX, Articles of Religion). 3. We bishops resolve to teach a course at least annually within our respective Annual Conferences on the basic beliefs in our Articles of Religion and Confession of Faith. We will invite clergy and laity to attend. Then we will urge our clergy and laity to replicate that course in their respective charges. 4. We urge all ministers to extend regularly an invitation to Christian discipleship in the context of their worship services. Worshipers should be invited to repent of their sin and to trust in the crucified and risen Christ for their personal salvation. 5. We deplore the fact that approximately 43 percent of our local churches did not receive a single new member by profession of faith last year. We pledge, with the assistance of our district superintendents, to meet with pastors of those churches in order to offer to them specific suggestions for helping God lead persons to make professions of faith. 6. We affirm that the single most important criterion of a local church’s faithfulness in ministry is that new disciples are being made and new members being received by profession of faith. Our Lord’s last mandate — “Go and make disciples” — is and should be our first and most important task. Brothers and sisters, we will undergird these commitments with daily prayers for the renewal of the UMC. Please join your prayers with ours. God may yet make our “dry bones” live again. Rather than becoming a “dead sect” as Wesley feared, we may yet become a mighty worldwide movement for Jesus Christ. Lord, come quickly and let it be so! Bill Bouknight retired from the pastorate in 2007 after more than 40 years of serving churches in South Carolina and Tennessee. He became an associate director of the Confessing Movement in August 2008. The initial meeting of what became the Confessing Movement Within the United Methodist Church was convened in 1994 by Bishop William R. Cannon, Dr. Maxie Dunnam of Asbury Theological Seminary, and Dr. Thomas C. Oden of the Drew University School of Theology. The UM Confessing Movement’s confessional statement, adopted in 1995 at an Atlanta gathering of 900 United Methodists, is here (PDF). A study published in late 2002 by the Journal for the Scientific Study of Religion found that approximately 40 percent of UM pastors “either support the ideals of or participate in” the Confessing Movement Within the United Methodist Church. The premiere podcast of our spring 2010 season features the leader who served for two decades as the bishop of the Los Angeles Area of The (United) Methodist Church: Bishop Gerald Kennedy. Born in Michigan and raised in California, Gerald Hamilton Kennedy was schooled at the College of the Pacific, the Pacific School of Religion, and Hartford Theological Seminary. In the 1930s and 40s, he served as a pastor and college instructor, leading churches in Connecticut, California and Nebraska, and teaching at the Pacific School of Religion and Nebraska Wesleyan University. 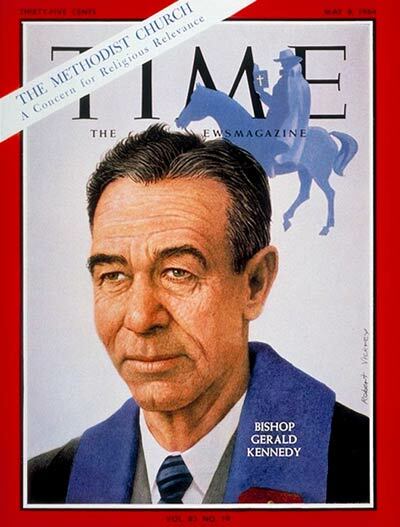 At the age of 40, in 1948, Gerald Kennedy was elected to the episcopacy and was assigned to the Portland, Oregon Area. Four years later, he was assigned to the Los Angeles Area (Southern California, Arizona, Hawaii) and continued in that post from 1952-1972. In 1960, just before beginning a term as president of the Council of Bishops of The Methodist Church, Bishop Kennedy wrote The Marks of a Methodist (Methodist Evangelistic Materials), echoing themes from John Wesley’s classic work, The Character of a Methodist. To listen, use the audio player below (23 min.) — or right click (Windows users) to download an mp3 (10.6MB). Additional addresses and sermons by Bishop Kennedy are available in the UMC Audio Library. For previous MethodistThinker Podcasts, and/or to subscribe via iTunes or other Podcast software, use the “Subscribe to Podcasts” link at the top of the right column. Bishop Kennedy’s hymn, God of Love and God of Power, written in 1939, is hymn #578 in the United Methodist Hymnal. An interesting historical footnote: Gerald Kennedy is the only United Methodist bishop to serve as both an active bishop and the pastor of a local church at the same time. In 1968, he appointed himself to the First United Methodist Church of Pasadena, California. The controversial appointment gave rise to a case that went to the UM Judicial Council. Bishop Kennedy served as the pastor of First UMC-Pasadena until 1973. He died Feb. 17, 1980, at the age of 72. Two weeks after many United Methodists were dismayed to discover that a General Board of the United Methodist Church was closely involved in passage of the sweeping new health-care law that has vastly expanded federal power and could lead to doctor shortages and medical delays, many evangelicals in the denomination are receiving a letter from a UM renewal leader urging them not to give up on the UMC. “[I]t’s easy to become discouraged about The United Methodist Church,” Good News president Rob Renfroe wrote in a support letter dated April 1. “Some of our General Boards often take positions and make public declarations contrary to what we believe…. But I believe The United Methodist Church is worth fighting for,” he wrote. In supporting a government-centered overhaul of the American health-care system, GBCS claimed the mantle of three resolutions — two of which were authored by GBCS general secretary Jim Winkler — that were hastily passed in a combined vote on the frenetic final night of the 2008 General Conference. In addition to supporting final passage of the controversial health bill, GBCS earlier lobbied against a pro-life provision — included in the original House version but not in the final law — that would have prohibited the use of tax revenues to pay for abortions. Speaker Pelosi’s March 21 remarks about UMC support of the health bill ignited a firestorm of calls and e-mails to pastors, district superintendents and bishops from United Methodists concerned that the new law is likely to damage the quality of U.S. health care and lead to taxpayer funding of abortions (PDF). With some United Methodists even considering leaving the UMC in the wake of the denomination’s involvement in passage of the controversial law, Rob Renfroe’s April 1 letter has taken on a perhaps unanticipated poignancy. In the letter, Mr. Renfroe argues that working for United Methodist renewal is a sacred trust that must not be abandoned, no matter how difficult the fight. I believe that a Wesleyan understanding of the Gospel is one of God’s great gifts to the world. The combinations of heart and head, personal faith and social holiness, the primacy of grace and the necessity of spiritual disciplines — the balanced theology God gave us through John Wesley is something worth protecting, preserving, and promoting. It’s a holy gift. And I refuse to walk away and leave it in the hands of those who neither appreciate it nor understand it [italics in original]…. I also believe The United Methodist Church…[has] a critical role to play in God’s redemptive purposes…. In spite of everything, we are still seen as a church that can be trusted by persons who are unchurched. We are the kind of church that parents bring their children and teenagers to and that they attend for themselves when live is hard and they are looking for a better way. We Methodists continue to have an unparalleled opportunity to bring the lost into a saving relationship with Jesus Christ. Rob Renfroe was named president of Good News and publisher of Good News magazine last year, after serving several years as a leader of the UM Confessing Movement. He also serves as the pastor of discipleship at The Woodlands United Methodist Church near Houston, Texas. Before being appointed to The Woodlands, Mr. Renfroe was an executive pastor at First UMC in Houston, serving with late Dr. Bill Hinson. Good News, founded in 1967 (PDF), is considered the United Methodist Church’s flagship renewal ministry. April 2, 1877: Baptist evangelist Mordecai Ham (left) is born in Allen County, Kentucky. At the end of his ministry, he claimed one million converts — including Billy Graham, who made a profession of faith at a 1934 Ham meeting in Charlotte, North Carolina. April 4, 1742: Charles Wesley preaches his famous sermon, “Awake, Thou That Sleepest,” to the University of Oxford. The sermon soon became Methodism’s most popular tract. April 5, 1811: Robert Raikes, who launched the idea of “Sunday School” in England in 1780, dies. By 1784, 250,000 students were attending the schools. By Raikes’ death, 500,000. By 1831, 1.25 million. April 9, 1816: Richard Allen and others organize the African Methodist Episcopal Church in Philadelphia. The next day he was named the denomination’s first bishop, thereby becoming the first black bishop in the United States. A few years earlier, Allen and his colleagues had left the Methodist Episcopal Church (a predecessor of the United Methodist Church) when it removed blacks from “white” seats during prayer. April 10, 1829: William Booth is born. After several years as a Methodist minister, he founded what became known as The Salvation Army. In 1865, Booth (left) and his wife, Catherine, decided to reach the desperate poor and unchurched by conducting open-air meetings with lively music; preaching in theaters, bars, and jails; and creating large-scale plans to relieve poverty. His organization was instrumental in launching one of the most successful religious revivals in the modern era. April 12, 1914: A convention in Hot Springs, Arkansas, adjourns, having founded the Assemblies of God, which would become the world’s largest Pentecostal denomination. In 2009, the Assemblies of God moved past the PC(USA) to become the ninth largest denomination the U.S.
April 21, 1855: Edward Kimball, a Sunday school teacher in Boston, leads 18-year-old shoe salesman Dwight L. Moody to Christ at the Holton Shoe Store. Moody went on to become the most successful evangelist of his day. April 23, 1968: The Evangelical United Brethren Church joins with the much larger Methodist Church, forming the United Methodist Church (UMC), the largest Methodist group in the world. Use the audio player below to listen to the soundtrack of an 11-minute film, produced in 1968, about the merger of the two denominations. It begins with the announcement by Bishop Reuben Mueller of the EUB vote to approve the merger, then continues with Bishop Roy Short announcing the Methodist Church vote. April 27, 1775: Moravian minister and missionary Peter Boehler dies. He met John Wesley in 1737 while both were sailing to minister in America. Boehler’s assurance of faith and his belief in joyous, instantaneous conversion left a permanent mark on Wesley. Use the audio player below to listen to a radio dramatization of a conversation between Wesley and Boehler (set in London, rather than on board a ship). This 3-minute scene is from the BBC’s 1997 radio serial, Love Divine, which starred Clive Francis as John Wesley.